Since I have been blogging I have come across a lot of queries for dishes that I consider run of the mill. Chicken stir fry is one of them. If I had not seen a query for one, I would never have through to write down what goes into my stir fry. The dish will change a bit depending on my mood, what is in my fridge and what my taste buds are calling for. However, when I decided to write down a recipe for a stir fry I bought the ingredients I would most likely use time and time again. To me, chicken is the easiest protein to stir fry. There is very little risk of it being dry, under cooked or even over cooked. It is easy to slice and takes on robust flavours well. It is also an ingredient easily available, no matter where you live. There are no fancy tricks to getting a stir fry right. You need a wok preferably as it conducts heat better. Luckily for me I have a serious gas burner as this works best when stir frying. But, an ordinary large frying pan and an electric hob will work just as well. You need an oil that does not have a low smoke point – olive oil is not good for stir frying and peanut or ground nut oil is best. You need to cut the vegetables uniformly and add them to the wok in the order they need to cook in – the ones that take the longest get added first. Use my stir fry recipe as a guideline to get you started if you have never made a stir fry before, or use it as inspiration for your next stir fry meal if this is something you cook often. do you enjoy stir frying? I learned the hard way as a kid not to stir fry with evoo, lol…this sounds amazing! I can imagine the smoke! 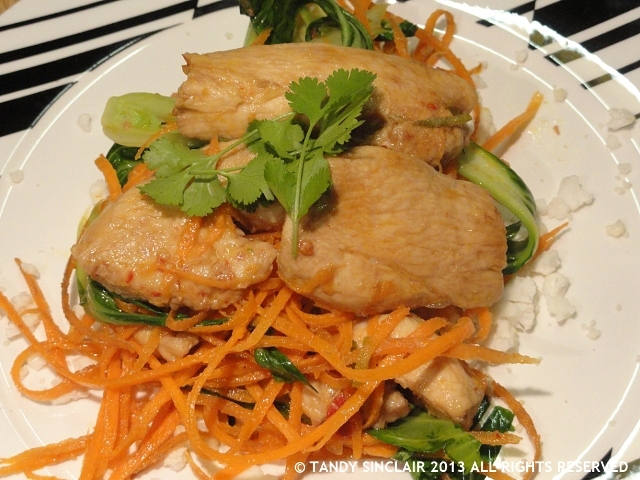 Yes, I love stir-fry, very versatile and fast…yours look delicious with the chicken and the veggies. I think they are adventurous enough to give it a go! I’m a bit the same Tandy, I never really think about what goes into my chicken stir fry, it’s usually a ‘chicken stirfry depends on’!! For sure, that is the easiest way for me as well! I like stir fries but definitely don’t make them enough! Love the sauce for this. I love stir fries and mine also often consist of what’s in the fridge. I don’t think I could plan a month ahead! I like your idea of the cauliflower rice. I love cooking stir fries. It’s such a quick and easy meal to do too. I wish I could get galangal paste here as I love the flavour and it’s very hard to find.